Lowest ranked France shredded Olympic champion Argentina’s reputation by spanking them 5-3 as two time runners up Spain became the first team to exit from the 14th World Cup hockey at Kalinga Stadium here today. A five goal blitz in the second quarter of the game saw France building up a sizable 4-1 over the second ranked team in the world and killing whatever hopes Spaniards might have entertained after drawing with the Kiwis earlier.. Though it was perhaps the biggest upset of the tournament still despite this heavy defeat, Argentina joined defending champion Australia to be the second team to qualify for the quarter finals of the tournament. Argentina topped the pool A with six points (two wins and a loss), France and New Zealand with four points each ,ended the pool at 2nd a 3rd place respectively while Spain with two points bade adieu to this edition of the tournament . At the start of the tournament no body gave a chance to France who were returning to the World cup after a gap of 28 years for only the third time.
.@FF_Hockey pulled up a fantastic show of might to beat @ArgFieldHockey in their last pool-stage encounter at the Odisha Hockey Men's World CUp Bhubaneswar 2018. Here are some best moments from the match. For the winners who led 4-1 at half time, the goal scorers were ,Hugo Genestet (18 mt) Victor Charlet (23rd) Aristide Coisne (26th), Gaspard Baumagarten (30th) Francois Goyet (54th) while Lucas Martinez (28th), Ganzalo Peillat (44th,48) reduced the margin for the losers. After the barren first quarter in which Argentina failed t capitalize on their chances including a penalty corner the second quarter turned out to be a goal fest with Argentina defence collapsing at an unbelievable pace. Two minutes into this quarter, France gave the notice for the things to come Their captain Tom Genestet made a very incisive move and Argentina goalkeeper Juan Vivaldi just managed to save it. But next minute Genestet dribbled his way through a crowded Argentinian area and send the ball home (1-0) Five minutes later the French made it 2-0 with Victor Charlet converting the second penalty corner (2-0). As it was not enough France rubbed more salt into their famed rivals’s wounds by scoring the third goal Aristide Coisne. 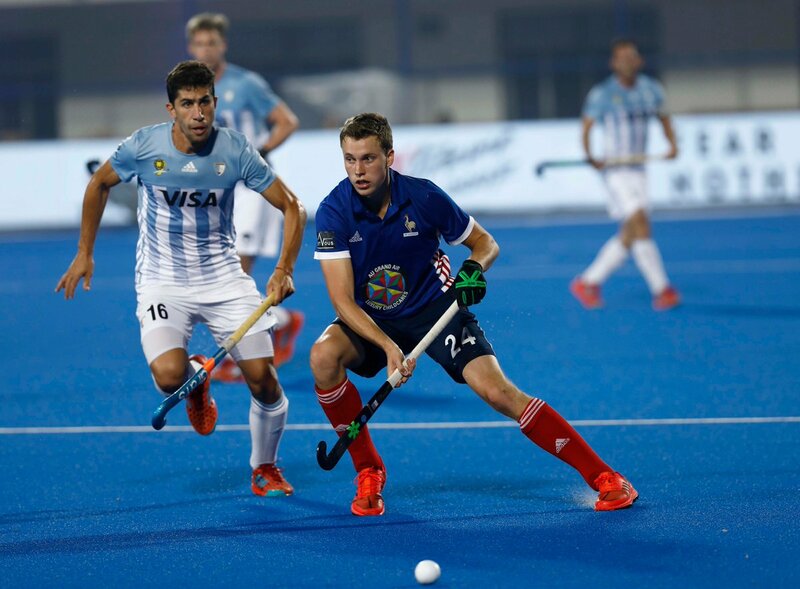 In the second session three more goals came two from Argentina ,both goals scored by drag flicker Ganzalo Peillat, which reduced the margin to 3-4 but six minutes before the final whistle Francois Goyet made it 5-3 to seal the match for France.